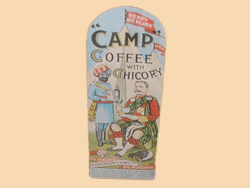 Labels for the large and small size bottles of "Camp" Coffee with Chicory, (state which?) produced by R. Paterson and Sons Ltd of Glasgow. Both sizes of the embossed bottles are frequently dug from period dumps.